Brexit, 5 Eyes and One More: Japan? 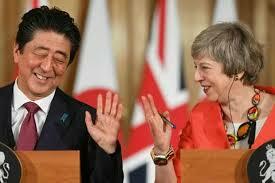 When Japanese Prime Minister Shinzo Abe visited his British counterpart, Theresa May, there was far more on the main agenda than common economic considerations with Brexit. Finally, given that the role of the '5 Eyes' is an important consideration with US-led military and security provision, it is only natural, therefore, for those in senior decision-making positions to now include Japan in their military planning. In early January Japanese Prime Minister Shinzo Abe met PM Theresa May in London for high-level diplomatic talks. In true British fashion official media releases were deliberately misleading to avoid unnecessary publicity about the real agenda items of meetings. Centuries of unbridled class and state power together with elite patronage systems have given the British ruling class the power to conduct their business in the manner they see fit. It has not been difficult to establish just who will be pulling the strings behind the Australian and Japanese puppets. During the final stages of the triangular military planning an official US Defence Department media release announced a transformation of their Defence Intelligence Agency (DIA). (6) The five-year military plan included the development of a 'spy service focussed on emerging threats and more closely aligned with the CIA and elite military commando units', and the full implementation of the triangular plan. (7) The hundreds of further DIA officers sent overseas were also not concerned with usual intelligence-gathering but military assessments of the balance of forces affecting US hegemonic positions. To conduct such assessments an intelligence agency has to establish possible threats 'from within'. It has also not been difficult to identify the logical outcome of the transformation of the DIA upon Australian society and elsewhere. Australians, in recent times, have also become used to wholesale domestic espionage being conducted through the state into the domestic arena. It has created an atmosphere of intrigue; wave after wave of official statements from Canberra about Islamic jihadists and sexual perverts have done little to dispel a general concern about individual rights and civil liberties. In fact, many believe so-called Homeland Security provision is little other than domestic espionage of an entire population using an umbrella organisation for ulterior motives and Cold War planning, directly primarily at progressive-minded people, trade-unions and community organisations in the spurious name of 'national security'. The rise of China in the Asia-Pacific region has been assessed by the Pentagon as a threat to traditional US hegemonic positions. Numerous reports, from right-wing think-tanks including the Australian Strategic Policy Institute, for example, have stressed that 'Australia's strategic outlook is deteriorating', and that 'there's a real risk that South-east Asia is becoming a Chinese sphere of influence'. (9) It is significant to note such organisations invariably follow US-led diplomatic positions as a matter of course. As the British Commonwealth has eleven member countries in the Pacific region, the US-led triangular defence and security provision has been keen to use Westminster to facilitate and develop strategic alliances. A number of the countries possess significance in regional military planning for proximity to sensitive shipping-lanes and as convenient vantage points to conduct surveillance across the region. They also provide strategic outposts for further diplomacy elsewhere in the wider region; Papua New Guinea, for example, has an important position within inner Commonwealth and Melanesian circles, and also forms a strategic part of the Defence of Australia doctrine. Postscipt: New Zealanders will protest on that Australian day of infamy, January 26, outside the US spy base at Waihopai. “Waihopai does not operate in the national interest of New Zealand. In all but name it is a foreign spy base on NZ soil, paid for with hundreds of millions of our tax dollars; it spies on Kiwis and foreigners; it is NZ’s key contribution to America’s global spying & war machine. Waihopai must be closed,” said Horton. 1. May hopes Japanese PM., The Guardian (U.K.), 9 January 2019. 2. May deal 'threatens national security', The Weekend Australian, 12-13 January 2019. 4. China forum warns no silver lining in trade stand-off, Australian, 8 January 2019. 5. Japan, Australia mull agreement on closer military ties, Australian, 27 December 2017. 6. Pentagon plays the spy game, The Guardian Weekly (U.K.), 7 December 2012. 8. Crime busters 'to quit rather than move', The Weekend Australian, 12-13 January 2019. 9. China's rise a threat to security, Australian, 15 November 2017. 10. Prince Charles greeted by colourful dancers upon arrival in Vanuatu, 9 News, 7 April 2018. 11. China eyes Vanuatu military base, Sydney Morning Herald, 9 April 2018. 12. Weekend Australian, op.cit., 12-13 January 2019.